Tjenu or as it was also known by its Greek variations, Thinis or This, is related of the Archaic Period of Egyptian history. Thinis was the home of the first kings (pharaos) of a unified Egypt. Those Pharaohs belongs of the First and Second Dynasties of Egyptian history. In some references Thinis has lent its name to these combined dynasties and they are known collectively as the Thinite Dynasties. Thinite dynasty was possibly born from Manetho’s connection of them with the city of Thinis. 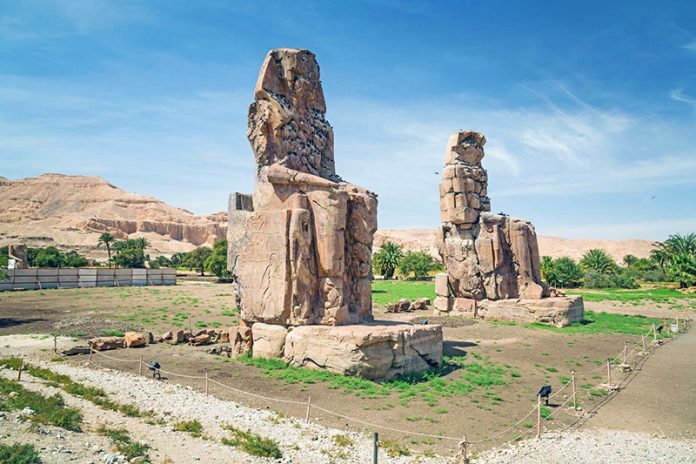 The location of the ancient city of Thinis is still object of research, but it was obviously a place of importance, if not nationally than at least regionally as the capital of the 8th Nome of Upper Egypt. While the resting place of the city eludes archaeologists there are a few locales that could be likely candidates. Modern Girga, located north of Abydos or Abedjou/Abdju (west bank of the Nile river), is a favorite although modern el-Birba is in the running and one must not overlook that Thinis has been associated with Abydos itself on more than one occasion. What relationship there would have been between Abydos and Thinis is uncertain. But Abydos could have been the resting place for many of the elite of the Thinite nobility. Thinis probably had been the home to the kings of the First and Second Dynasties, it would have been a city of high importance, second only to Men-nefer (Memphis) in the north – a thriving center of social, political, cultural and religious activity and more importantly, the birthplace of the kings and their forefathers. We can only imagine what it would have looked like, but it is very likely it would have been constructed similar to another Egyptian city, Nekhen or later political center of Upper Egypt. It would have been bustling with life, sounds, scents and sites to tempt all the senses and pull one in closer to view the pulsing life of an ancient Egyptian city. Thinis city itself would have been surrounded by a wall, probably originally constructed as defensive, but now – in this time of peace and prosperity, more of a boundary marker. Within the walled city one would find workshops to accommodation of the craftsmen, breweries, temples dedicated to gods of state and the patron deity of the “nome” and there, located close to the temples, would have been the homes of the nobles. Farms abutting the Nile would lie outside the city walls with herding camps nearby to provide more staples needed by the thriving community. As a political and military center, Thinis would have played a very important role during the process of unification – providing troops, weapons and food for the king’s army and possibly acting as a departure point for more northern military excursions. After the unification, the city would have been a hub for administrative activity for the government of Upper Egypt – acting as a southern counterpart to the northern city of Men-nefer. Though the land was unified under one king, both Upper and Lower Egypt retained some individuality and it was necessary to maintain two administrative structures to govern the land peacefully. In this way, Thinis retained its importance as the capital of Upper Egypt and it would be many years before that importance would diminish. Although through time the prominence of Thinis would decrease and the city itself would fade from man’s sight, its legend endures to lure us to discover it – the prestigious birthplace of the first kings of a unified Egypt. As with other Egyptian cities, Waset or Thebes was considered by its inhabitants first and foremost a temple founded on the primeval mound of creation. It was the divine dwelling place of the god Amun and because of this, its citizens had a special relationship with their city and the place of their birth. It was their home, the place they aspired to return to and the place in which they wished to be buried. As a town, Thebes seems to have emerged from obscurity during the Old Kingdom which makes its history relatively recent in comparison to older cities like Abu. 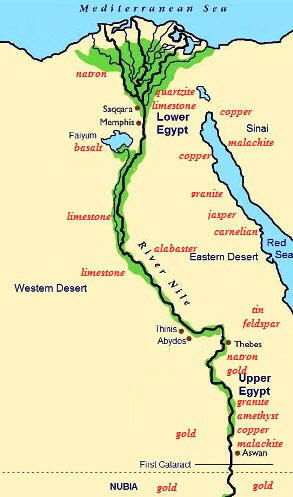 It gained prominence when the rulers of New Kingdom adopted Thebes as their base and administrative centre. It would be the rulers of the succeeding dynasty who established Waset as the capitol of Upper Egypt. The city reached its apogee in the New Kingdom and, although no longer Egypt’s capitol, the city retained political and religious significance thereafter. It was not until the Late Period that the city’s importance declined. Royal burials on Waset’s west bank began to occur in the royal necropolises of the New Kingdom period. The west bank is home to the grave sites of ruler, official and workman alike. The Valley of the Kings and the Valley of the Queens saw the burials of rulers such as Ramesses II, Merenptah, Tiye, Ay, Seti I and Horemheb. The private tombs of Yuya and Thuyu, Bay and others are also located on the west bank along with the Deir el-Medina workers’ necropolis. Mortuary temples abound one of the most famous being that of Hatshepsut at Deir el-Bahri. Also on the west bank, palaces were constructed the most notable of which was Amenhotep III’s residential palace at Malkata (Malqata). Waset is also home to Karnak ‘the most select of places’, a temple complex dedicated to the cults of Amun-Ra. Two kilometers distant and dedicated to the divine triad of Amun, Mut and Khons, the temple complex of Luxor known at the time as the ‘Southern Harem’, together with Karnak, provided one of the reasons for the city’s importance. Using the vehicle of Amun’s visit to his wife Mut who it was believed resided in Luxor, the yearly sacred Festival of Opet begun in Karnak and culminating in Luxor would see the deified king re-emerge from the brink of chaos rebirthed as the son of Amun-Re, a symbolic gesture that ascribed divine status on the king and, because of it, ensured the continued existence and heka of the Egyptian state. Anderson, David A. (1999), “Abydos, Predynastic sites”, in Bard, Kathryn A., Encyclopedia of the archaeology of ancient Egypt, London: Routledge. Bagnall, Roger S. (1996) . Egypt in late antiquity. Princeton: Princeton University Press. ISBN 978-0-691-01096-0.